When I was a child, my parents took our family to Rochester, New York to visit the Kodak Museum (called the George Eastman Museum). If there was ONE thing that I remember, it was this round cylindrical device that showed moving images. (I’m positive I saw it there!) 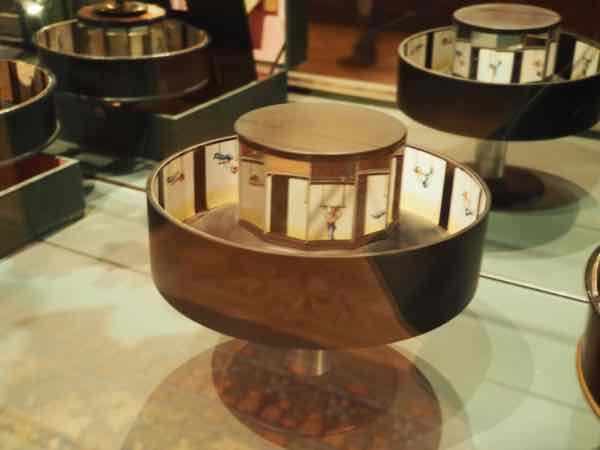 It was called a Zoetrope and it was invented before “film animation” was created. 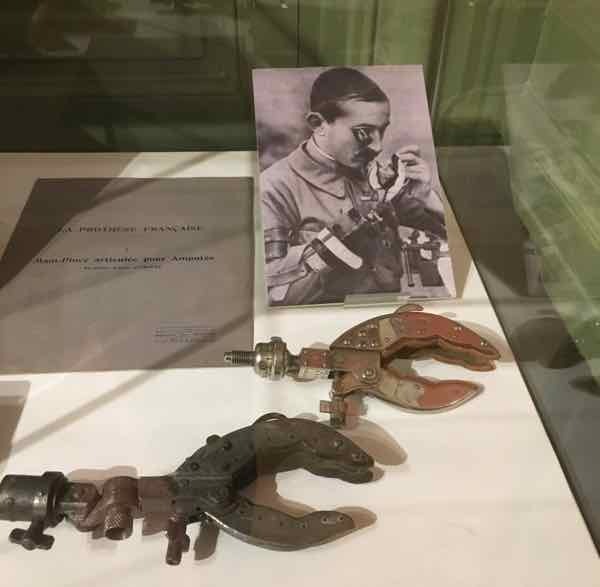 Since then I have always been intrigued with movie-making, so when I was in France recently, I was able to discover more about the history of cinema at the Lumière Museum in Lyon. 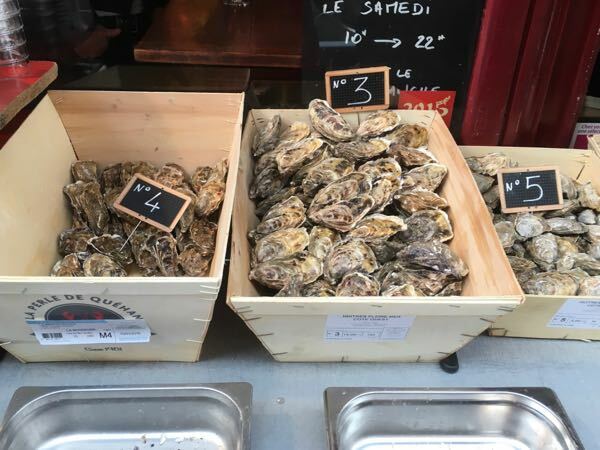 While Lyon is often noted for being one of the culinary capitals of France (along with Paris), it might be surprising to discover that filmmaking and cinema are especially famous here as it is in this city that “moving pictures” got its start. 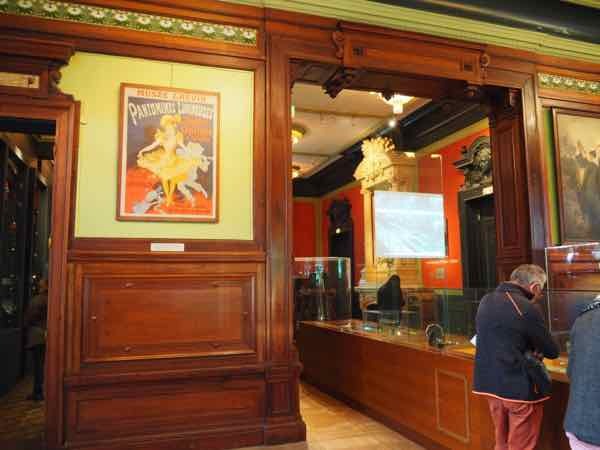 Institut Lumiere is a “museum, film library, resource and conservation centre” dedicated to the Lumière brothers, Auguste and Louis, who brought cinema to the world in the late 1800s. Today Institut Lumière sits on the property where the Lumière factory stood. The Institut is composed of Villa Lumière (the Lumière Museum), the hangar (originally a factory and now a theatre) and a park for celebrating cinema. 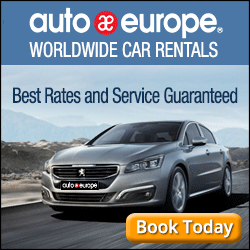 In fact, the Grand Lyon Film Festival is held here and in numerous places throughout Lyon each year. 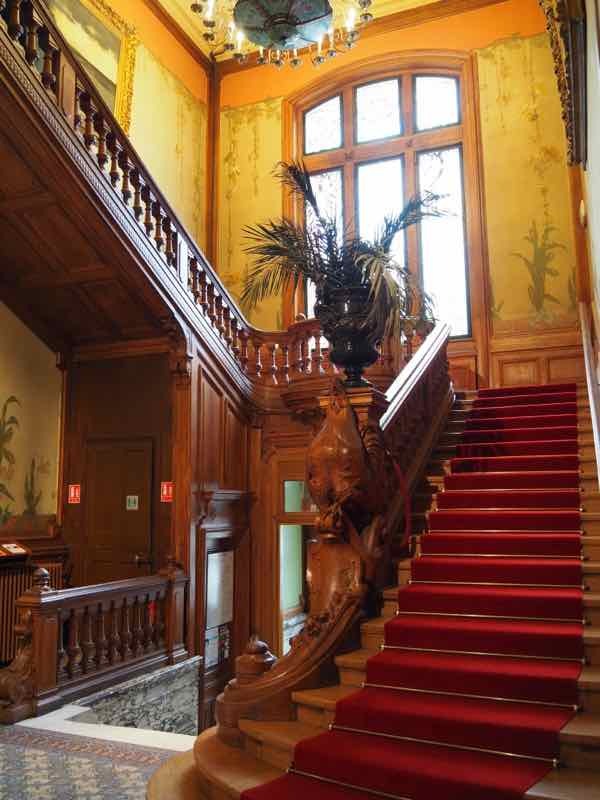 It is inside the family home, Villa Lumière, also called the “castle”, where you will find beautiful architecture, a grand staircase and a vast collection of film-making artifacts which show the history and development of film-making through the years. The Villa was built in 1902 by the Lumiere father, Antoine. 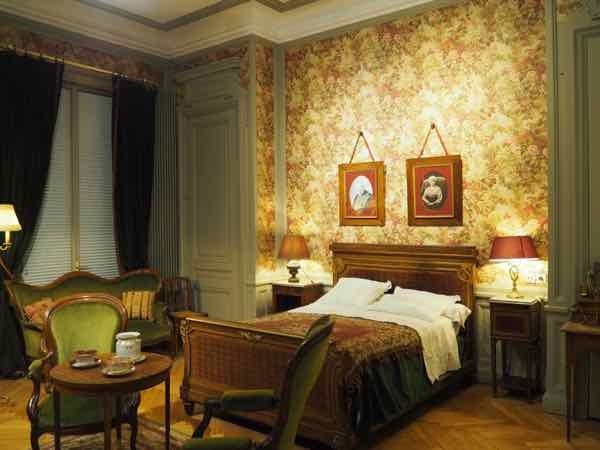 It still retains its 1900s decor and art nouveau architecture. Exquisite chandeliers, mosaics, and marble fireplaces accent the building. 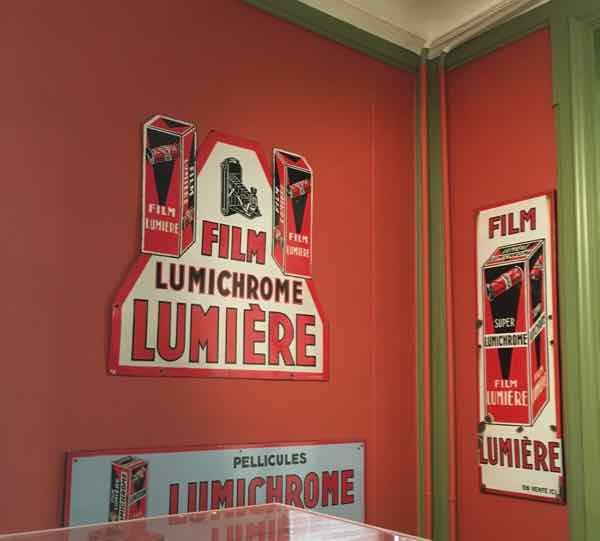 The ground floor has many of the pre-film devices that inspired the Lumiere brothers as well as many photographic products manufactured by the Lumiere company. Before 1895 people could only watch a film through a Kinetoscope which was invented by Thomas Edison. 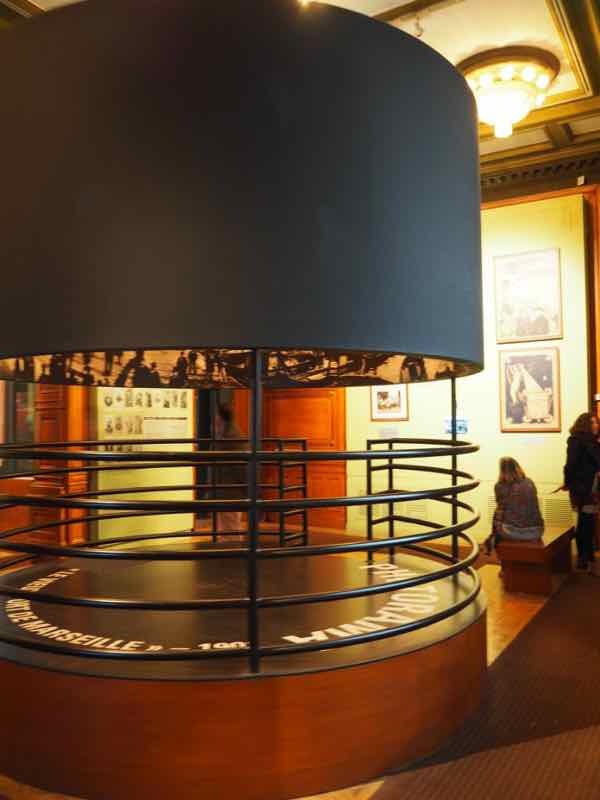 Visitors paid 25 cents to look through a peep hole at the top of a box to watch a short film. It was only possible for one person to see it. Projected films for audiences had not yet been invented. That’s when the Cinematograph came along. It was invented by Louis Lumière. 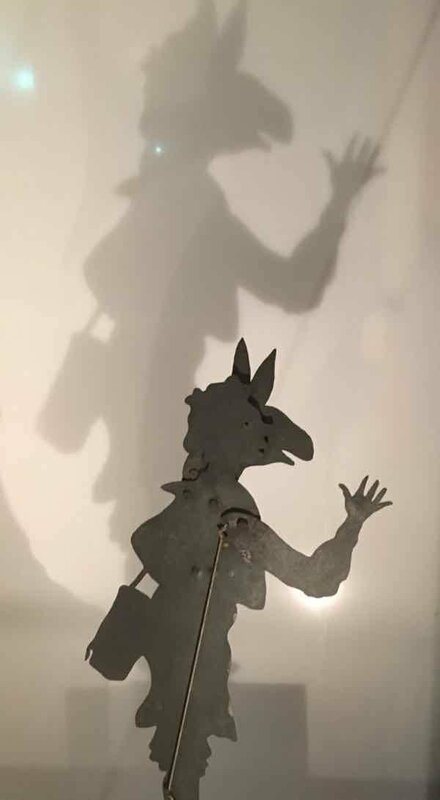 The first projected film (silent, black and white, and just under 50 seconds) was shot using the Cinematograph and it was called, “La Sortie des Usines Lumieres” (Exit of the Lumieres factories). 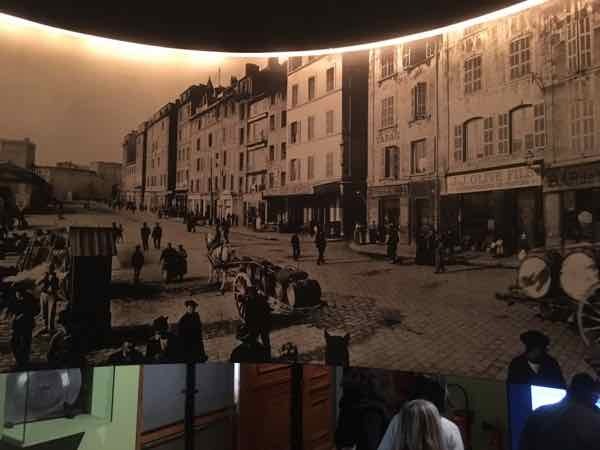 It showed Lumiere employees leaving the factory in 1895 and was shown to a paying audience at the Salon du Grand Café in Paris. The Cinematograph was capable of filming, printing and projecting all in one. It was a film projector that only weighed 16 pounds. 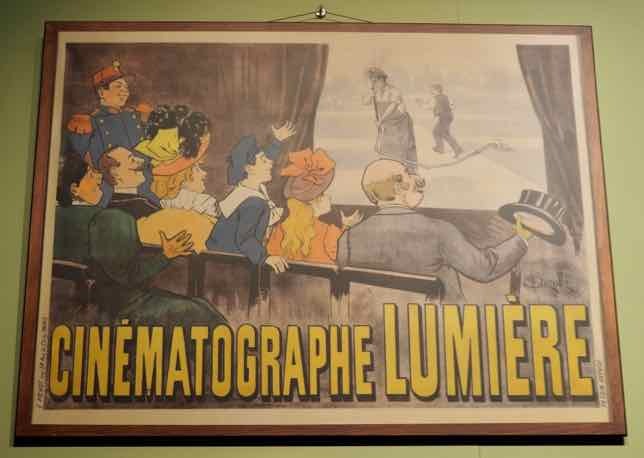 The Lumiere Company had trained operators who travelled the world showing films. One of the most famous was Gabriel Veyre who created films in Mexico, Japan, Indo-China, Canada, and Morocco. A whole room on the second floor is dedicated to Veyre and his work. The final piece of equipment on the first floor is large and impressive: the Photorama. The Lumière brothers were ahead of their time. They created a process to show a panoramic photograph on a 360 degree cylindrical screen. Customers would go onto a platform and see the image all around. 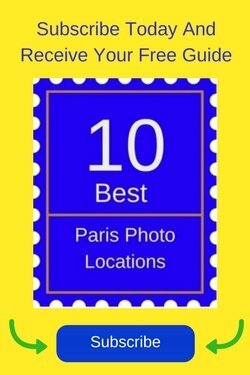 The invention’s popularity did not last a long time and the Photorama room in Paris closed in 1903 as it was too expensive to maintain. One room is devoted to many of the photographic products which the company produced including photographic paper and various cameras. “Tulle Gras” dressing, which is dressing to treat burns. 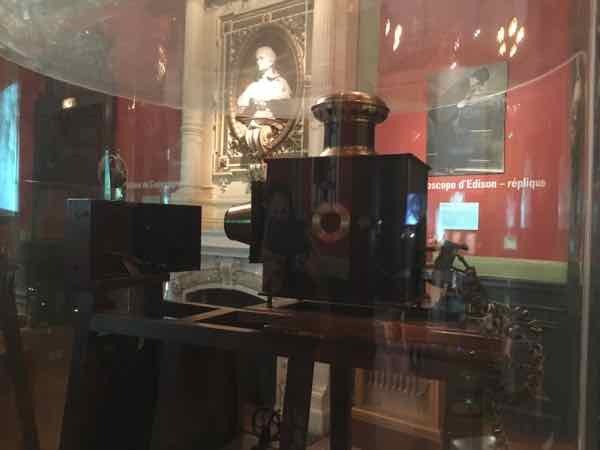 FInally, there is a projection room which shows a documentary about the Lumière family. If you can’t make it to Lyon and the Insitut Lumière, check out the film, “Paris Can Wait”, starring Diane Lane. There are a few scenes where Lane’s character visits the Institut and sees some of the inventions. Thank you so much. I think much of the time it’s the photos that make it look good. 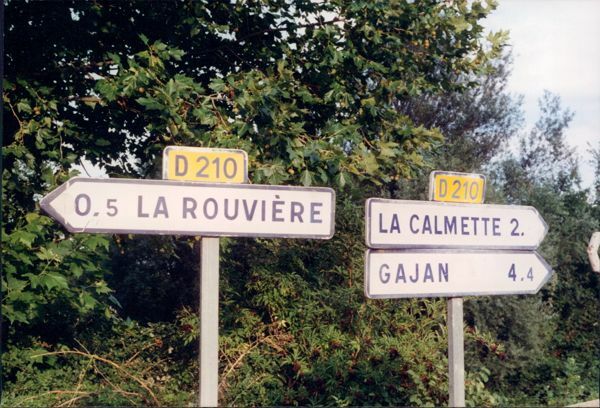 I love taking photographs in France. Thanks for the very interesting article! 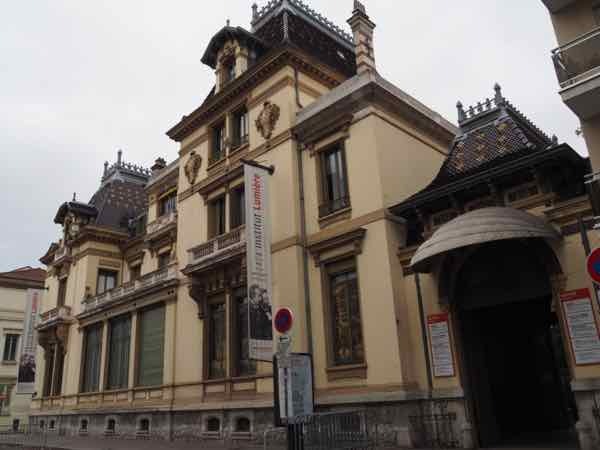 I will have to go to the museum when I visit Lyon next. I love movies so this is right up my alley. What an incredible place! Filled with so much history and interesting things to see, not to mention beauty. Thanks for the tip about the movie with Diane Lane…at least I’ll be able to catch a few glimpses of the museum if I don’t make it there in person. I hope you do make it to Lyon one day. It’s a great city. As a passionate lover of films and cinema, visiting this museum would be an ultimate experience for me. So, I am adding the Lumière Museum to my bucket list. 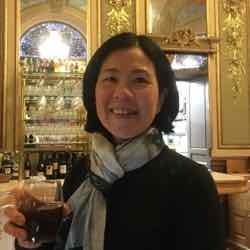 Thanks for the inspiring post, Jan! You’re welcome. 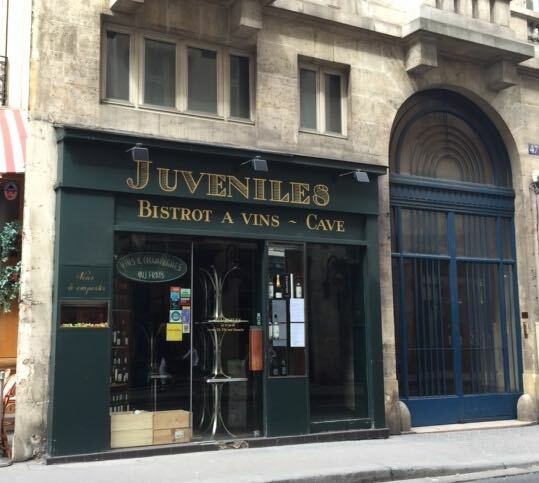 I hope you make it to Lyon to see the museum!